Red’s father, Felt, was born on Lookout Mountain in “Moore Holler” near Ascalon on February 13, 1881. Felt’s grandparents, Charles F. and Nancy Moore are believed to have moved to the Lookout Mountain area from North Carolina. Felt’s parents were John Jefferson Moore, youngest son of Charles, and Mary Catherine Jay, daughter of Rev. David Jay and Elizabeth Wallace of Lafayette. Felt died January 2, 1975 and is buried in Chickamauga, Georgia. Red’s mother, Bessie, was born in Cole City, daughter of William Henry “Billy” Dugan (then spelled Doogan) and Lenora “Nora” Hixon. Bessie was born on December 27, 1886, died May 4, 1984 and is also buried in Chickamauga, Georgia. As a boy, Red had a pet horse named Jim who would jump up on Red with his front hooves and was also known to chase Red’s sisters out of the pasture. Red attended Slygo School, grades 1-4, he went to Morganville grades 5-9 and attended Trenton for grades 10 and 11. Red loved basketball and played from grades 6-11 attaining the position of first team guard at Trenton. Red married Hazel Lorraine Patterson. The oldest child of John S. and Pearl Lee Coins Patterson, Hazel was born March 3, 1922 in Thornton (Letcher County), Kentucky. Her father, John, was born in Durham, Georgia May 5, 1892. He became a coal miner. 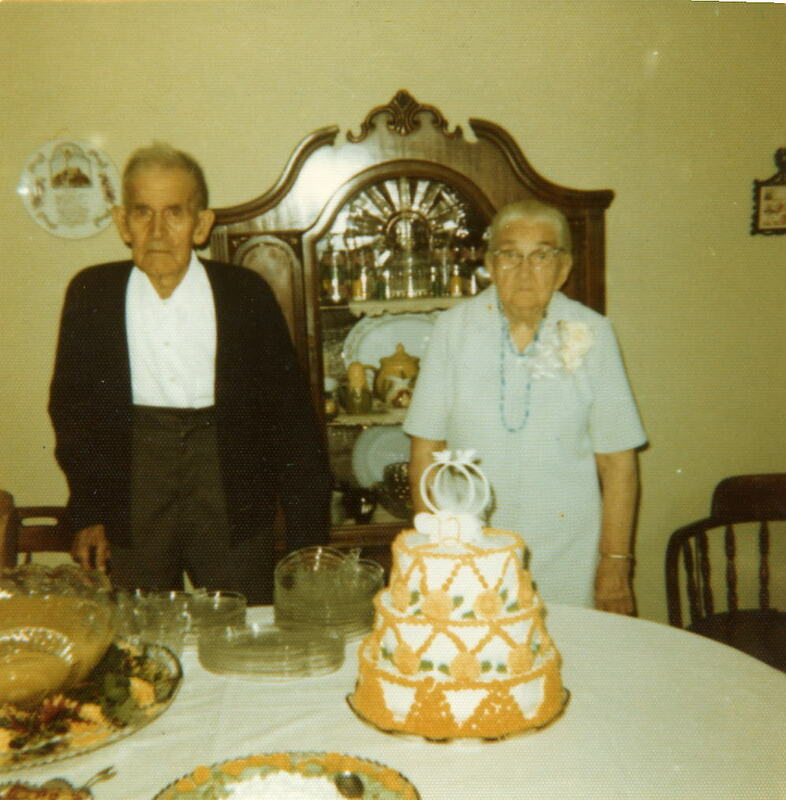 Pearl Lee Goins was born in Thornton, Kentucky on June 5, 1901 and met and married John there November 11, 1920. John died February 15, 1964 and Pearl died December 8, 1988. Both are buried in Bethlehem Cemetery in Slygo. When Hazel was nine, the family including her brothers Benton Franklin (February 12, 1924 –November 15, 1981) and Claude Newton (April 23, 1925) moved to Georgia in a Model T Ford. The trip took about 15 hours. Hazel remembers her daddy asking her to hold the choke…she’s not sure if there was a problem or it was her father’s way of keeping her busy… and, she remembers stopping along the way to watch people picking strawberries in Tennessee. It was the first time she remembered witnessing strawberry picking. Hazel attended school at Morganville and Trenton. Her sister, Nancy Sharon, was born in Slygo May 9, 1942. Red and Hazel were married by Ray Crow, Justice of the Peace, in Rossville, Georgia on October 5, 1940. Red had worked at Sears & Roebuck as a roofer in 1936; in 1938 he went to work at a brass foundry, and on September 1, 1940 he joined Combustion Engineering where he was to work for the next 39 years. He was a member of Boilermakers Local Union 656 until his retirement in 1979. Red did not serve in World War II. He was employed in a strategic defense job at Combustion Engineering during the war. In 1945, Red and Hazel bought 40 acres of land in Slygo from Bill Drew. The property straddles the Dugan Loop Road and runs west toward Earl Cole’s property. Their house located on the north side of Slygo Road at the top of the first hill west of 1-59 is the original dwelling. It underwent two major renovations between 1945 and 1965 including the addition of a full basement which Red hand dug in 1965. In the early ’50’s, Red lost his right eye in a freak accident when he was loading cows to take them to the stockyard. This loss slowed him only briefly, and many people never knew he wore an artificial eye. Hazel was employed at the Evelene Shoppe in Trenton for about ten years about 1960-70. She volunteered her time as a gray lady at Hutcheson Memorial Hospital prior to becoming employed. 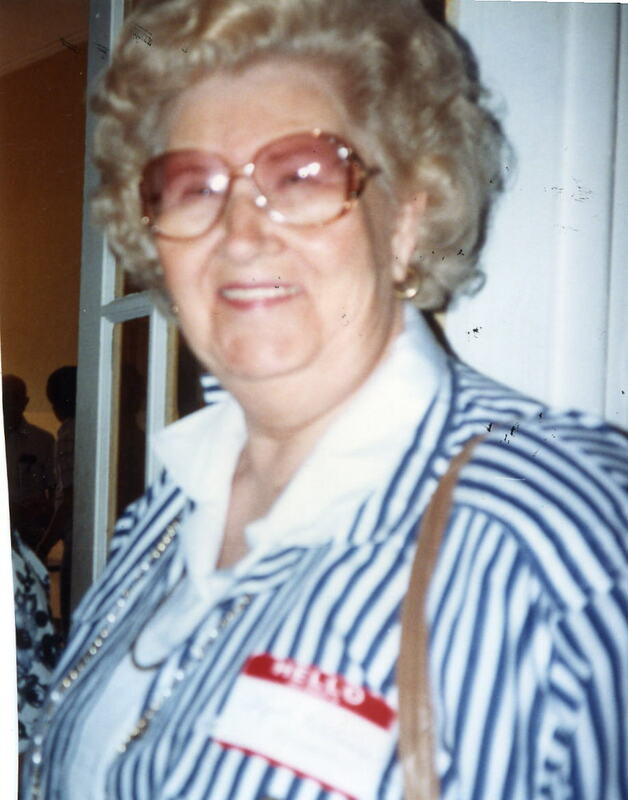 Red and Hazel were active members of the Slygo United Methodist Church where she belonged to UMW and both sang in the Brush Arbor Choir as well as the church choir. They were members of the Slygo Community Club, and both served as Trustees of the Bethlehem Church and Cemetery in Slygo. They were active in North Dade and Dade High School activities while their children were in school. Hazel served as President of PTA and a Girl Scout leader. married April 20, 1984 to Carolyn Friddell born September 30, 1955 of Chattanooga, TN. They had no children. They were married in New Orleans, LA. 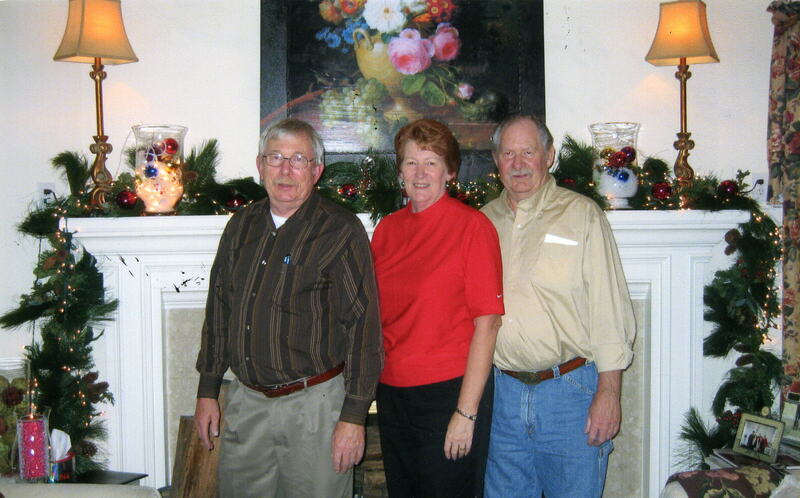 Larry developed an eleven-lot subdivision in Slygo on Red Moore Road where they now live. Gary Wayne, Sr. born May 14, 1944 married June 12, 1965 to Sharon Yvonne Reeves born February 1, 1947 of Rising Fawn, GA, father and mother of a daughter, Rebecca Allyson born June 21, 1969 and a son, Gary Wayne, Jr. “Bubba” born September 20, 1971 and a daughter, Shelley Kay born June 7, 1974 They were married at the Rising Fawn Baptist Church. They live in Marietta, Georgia. Shirley Gail Moore born April 28, 1950 married January 8, 1972 to James Felton Shelley born June 10, 1930 of Cartersville, GA. They had no children. They were married at Slyqo United Methodist Church. Jim died of lymphoma in 1991 and is buried in Bethlehem Cemetery in Slygo. Gail married Lee Richard Hedden at the North United Methodist Church in Sarasota, Florida on February 13, 1993. Lee was born in Plainfield, New Jersey on October 13, 1950. Lee and Gail have no children. They live in Sarasota, Florida. Red died April 5, 1989 after six years of fighting lymphoma and leukemia. He is buried in Bethlehem Cemetery. Hazel still lives in Slygo. I just wanted to make a correction that Bruce Felton Moore died on January 16th, 2007. He was my Granddad and was without a doubt the most unique and interesting person I’ve ever known. He was like a Dad to me and my brothers and sisters, and there’s not a day that goes by that I don’t think of him and my Grandma; Elsie Moore. Two people who made this world a better place for having been here.